About six p.m. the canoe was run upon the beach, and an hour spent in supper, which, to the Indians, consisted of tea and salmon. Embarking at seven, they paddled until ten o'clock, when, finding an opening in the rock-bound coast, we put ashore, spread our blankets upon the sand, and were soon sound asleep. At three a.m. we were roused and were soon under way, without any breakfast. This, however, did not matter much, as my stock of provisions consisted of ship biscuit and smoked salmon. Biscuit and salmon for breakfast and supper, salmon and biscuit for dinner. The Indians upon the trip only averaged one meal the 24 hours. During the morning, passing the mouth of a shallow mountain stream, the canoe was anchored to a big rock. The Indians, wading up the stream, in a few minutes, with poles and paddles clubbed to death some 30 salmon, averaging 25 pounds each in weight. These were thrown into the canoe and taken along. . . .
Toward evening we passed Cape Fox and boldly launched out to cross an arm of the sea, and once out, it was as dangerous to turn back as to go forward. The night was dark, the waves rolling high, and the storm upon us. One Indian stood upon the prow of the canoe watching the waves and giving orders. Every man was at his place, and the stroke of the paddles kept time with the measured song of the leader, causing the canoe to mount each wave with two strokes; then, with a click, each paddle would, at the same instant, strike the side of the canoe and remain motionless, gathering strength for the next wave. As the billows struck the canoe it quivered from stem to stern. It was a long, tedious night, as in the rain and fog and darkness we tossed in a frail canoe upon the waters, but daylight found us near Fort Tongas. Many non- and semi-Christian groups also laid claim to the West, but none more successfully than the Mormons. Protestant missions to Native Americans had few shining moments. The Whitman Massacre reveals much of what was noble and flawed regarding missions to Native Americans. 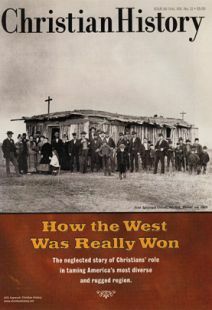 The wide-open West was served, state by state, by brave and sometimes beleaguered ministers and missionaries like these.